Be the first to share your favorite memory, photo or story of HILDRED . This memorial page is dedicated for family, friends and future generations to celebrate the life of their loved one. 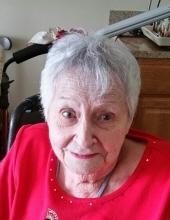 Hildred Andrews, 96, of Kansas City passed away Feb.9, 2019. Hildred was born July 26, 1922 to Newton and Alta McGraw in St. Louis MO. In 1942 she married Rolland Andrews and after the war they settled in Billings MO. Hildred worked in the Billings post office for 28 years. She was a member of Billings Christian Church. Hildred was preceeded on death by her husband and two brothers. She is survived by her daughters, Sharron Zaun (Neal) and Debbie Painter (Robert); grandson Michael Zaun (Kim); great grandchildren Maxwell and Jordan Zaun, and a sister, Laveen Killeen. Graveside service at Marionville Cemetery Wed. Feb. 13, 2:30pm. Later memorial service will be held in K.C. To send flowers or a remembrance gift to the family of HILDRED LILLIAN ANDREWS, please visit our Tribute Store. "Email Address" would like to share the life celebration of HILDRED LILLIAN ANDREWS. Click on the "link" to go to share a favorite memory or leave a condolence message for the family.